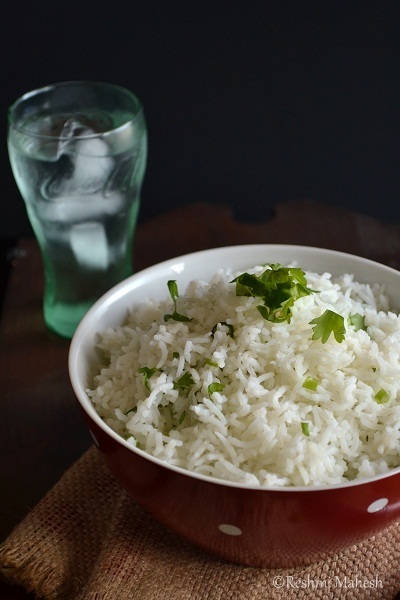 A quick and delicious rice...Goes perfect with a spicy side..
1.You can either use pre cooked rice or you can cook the rice with 1:2(rice:water ratio).I like adding salt while cooking the rice. After cooking let the rice come to room temperature. 2. Heat olive oil in a pan and fry the green chilies for few seconds.Turn off the heat and add this hot oil to the rice. 3. Here if you have not added salt while cooking rice add the required amount of salt. Mix this and add the lemon juice and cilantro and mix well. 4. Serve warm with spicy side of your choice. 1. Adding green chili is just for the heat. You can omit that. You can also add rice to the oil and mix well for few seconds. Then remove from heat, and mix the cilantro and lemon juice. 2. Do not mix lemon juice while very hot as it yields a bitter taste. neat presentation.. will be tasty with spicy side dish..
Flavorful rice,perfect with a spicy curry. 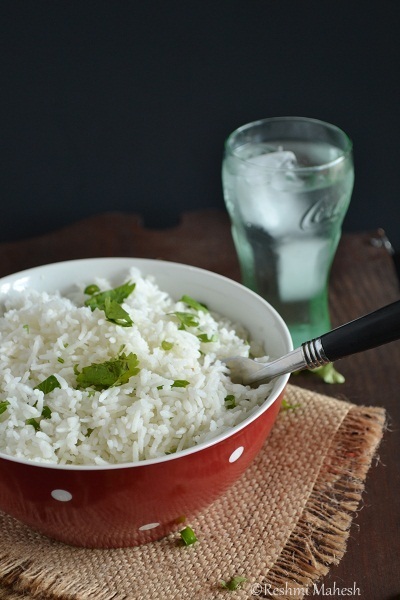 wow..fab clicks..Simple n flavorful rice dear!! YUM YUM love this Platter..Looks soo beautiful..
nice recipe....love the combo too....am ur happyfollower now!! Love this simple but delicious rice......very flavorful dear. Will this taste similar to the one in chipotle? Looks very much similar!! we love the one served in chipotle!!! yours looks so amazing!!! Nice. So different from the yellow heavily spiced lime rice! your flours - Corn flour Event in my blog. Loved the first click Reshmi..Such a subtle and yummy flavours! Hi Reshmi, 1 query...you added lemon or lime juice to the rice? 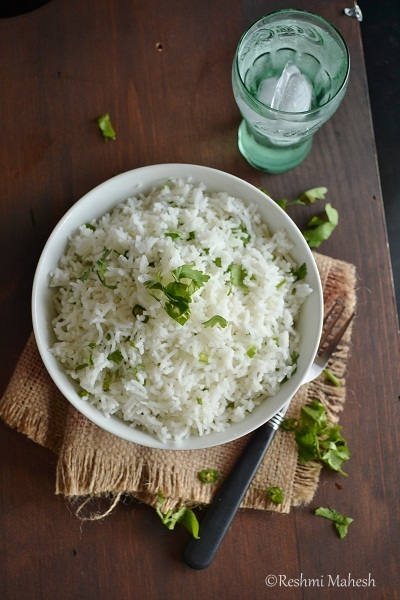 The title is Cilantro-Lime Rice. Can we add lime juice? @♥LOVE2COOK MALAYSIA♥: Hey I used lime juice..you can go with it..There is no much difference between too juices in terms of taste..only lemon is more tart than lime.Also you can increase or decrease the amount according to your family preference. Lovely clicks dear and amazing light effect. Looks really mouth watering. Nice combination variety rice, love the combo idea!! 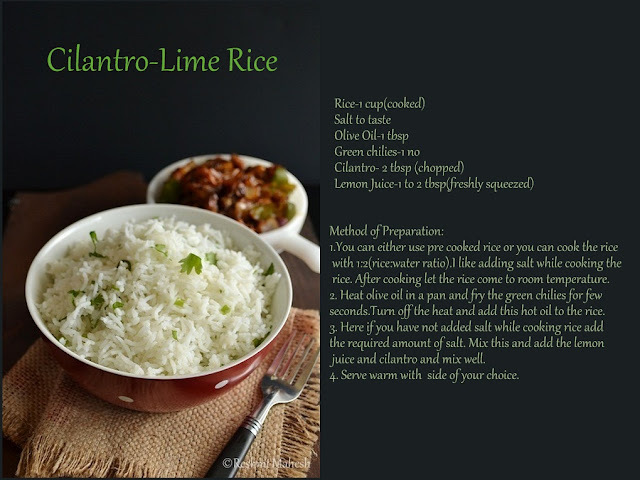 simple and delicious lime rice. 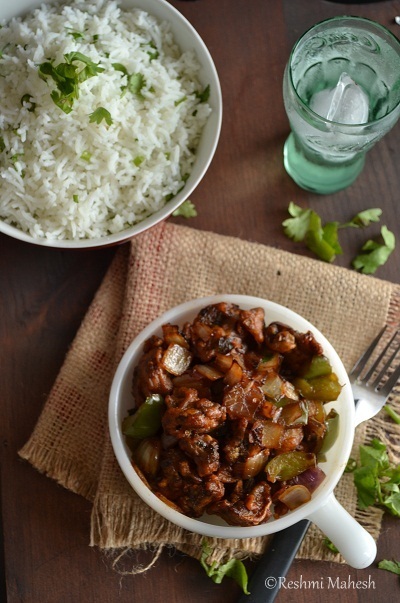 Super flavorful rice variation Reshmi.. 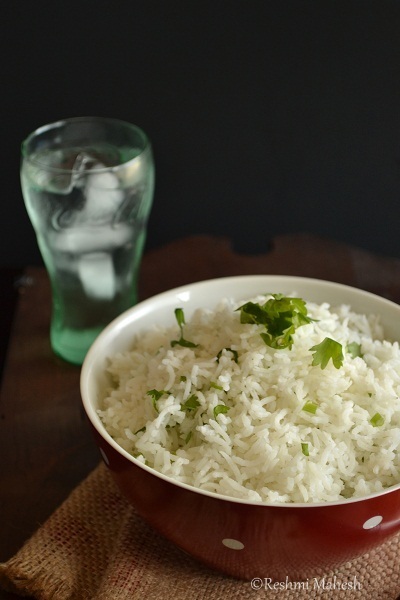 Delicious rice Reshmi. Nice clicks. I believe the flavor of this rice must have been very airy and delicate! I am sure it goes perfectly with a spicy meat! Wow..so simple n delicious rice..Neat presentation! Looks like a light and fresh dish.